Thomas Buchanan Read was an artist and poet who served as a staff officer in the Civil War. 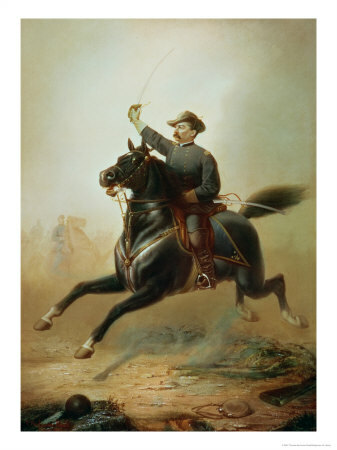 Inspired by Sheridan’s decisive victory at Cedar Creek on October 19, 1864, Read dashed off the poem, Sheridan’s Ride in an hour. The poem was a sensation throughout the North. To a war weary population, Cedar Creek was welcome proof that the seemingly endless War would soon end in Union victory. Public performances were held throughout the North. Republican rallies for the upcoming election featured readings of the poem with coconut shells used to mimic the sound of the horse’s hooves on the road. The Cedar Creek sensation helped to re-elect Lincoln. That was the “terrible oath” the author of “Sheridan’s Ride” referred to and it had the effect intended. The soldiers knew that “Little Phil” was frightfully in earnest, and there wasn’t a man in all the shattered army who wouldn’t share his bed. I asked General Sheridan the other day if he knew the author of the poem. “The very man. He was an actor at one of the Cincinnati theaters at the time, where I had known him. Murdock has always been a great friend of mine, and I am glad to know the old man keeps so well. I see that he was able to appear at the memorial services in honor of Chief Justice Chase the other day. Murdock lost a son at the battle of Missionary Ridge – the boy was in my command and the old man came down to get the body, don’t you know? The enemy occupied the place where the boy was buried, and Mr. Murdock remained a guest at my headquarters until we recovered the ground. He used to ride the lines with me every day, and always used my black horse ‘Rienzi’ – the one that was afterward called ‘Winchester’ and the same that I had under me on that twenty mile canter. No man ever straddled a better animal, and old Murdock became very fond of him. He was a horse that it was an honor to mount, you see, and in that poem Read gave him a good sendoff. “Well” continued Sheridan, “things were very exciting down around Chattanooga those days, and Mr. Murdock saw a good deal of war. On Sundays he always used to recite poems to the troops around headquarters, and there was one of Browning’s that the boys never missed a chance to call for. It was a great favorite with me, don’t you know, just as it was with the soldiers, and we never let the old man off without reading it. It was the story of the ride from Ghent to Aix – you remember it.